Recall a group yesterday went ahead to open a parallel secretariat for the main opposition party, the Peoples Democratic Party, in Abuja? The group which is ‘headed’ by five major men namely Prince Obi Nwosu, Alhaji Hassan Adamu, Chief Olusola Akindele, Chief Godwin Duru and Franklyne Edede said the party has come to stay and even called a press conference to make it formal. 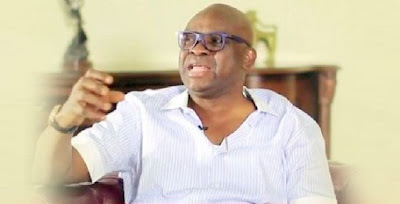 But Ekiti State Governor, Ayo Fayose and the Chairman, Peoples Democratic Party’s Governors’ Forum and the National Chairman of the PDP, Uche Secondus, are not having it and have said those who identified themselves as Fresh PDP members ought to have been arrested and jailed for disrupting the nation’s peace. Fayose, while hosting Secondus who had come in company of other members of the party’s National Working Committee for the local government election rally coming up in Ado Ekiti on Thursday (today), said the Fresh PDP members were mere distractors who should be ignored. According to a press statement by his Chief Press Secretary, Idowu Adelusi, the governor said, “In a civilised society those parading themselves as Fresh PDP members should have been clamped into jail. They are simply charlatans. I won’t be surprised and we are doing investigations to know those who are behind them. “In a society like Nigeria, where we need a virile opposition, we need to continually put the government of the day on its toes for them to know that Nigeria is greater than all of us, some miscreants would just issue press statement and say they are a splinter group or whatever they call themselves.